Ana Maria Gonzalez-Angulo, M.D., M.Sc., F.A.C.P. Postgraduate Training: Fellow, Susan G. Komen Interdisciplinary Breast Cancer, UT M.D. Anderson Cancer Center, Houston, TX, Gabriel N. Hortobagyi, M.D. Fellow, Medical Oncology, Ochsner Clinic Foundation, New Orleans, LA, John T. Cole, M.D. Resident, Internal Medicine, Mount Sinai Medical Center, Miami Beach, FL, Gloria B. Weinberg, M.D. Intern, Internal Medicine, Mount Sinai Medical Center, Miami Beach, FL, Gloria B. Weinberg, M.D. 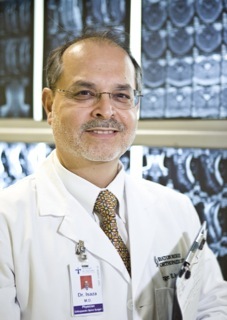 Dr. Jorge Isaza, an orthopedic surgeon specializing in adult and pediatric treatment and surgery of the spine at The Spine Institute at the Baton Rouge Orthopedic Clinic, is passionate about treating his patients with the most effective and advanced procedures available. He is extensively involved in the development of new technologies and treatment methods for spinal ailments, including the lumbar and cervical artificial disc, flexible rods and endoscopic discectomy. not be able to afford health care. Biography: Dr. Molina completed her MD training at the Universidad Francisco Marroquin in Guatemala, Central America. Thereafter, she pursued a PhD in Physiology at LSUHSC under the mentorship of Dr. John J. Spitzer, presenting her dissertation on “Ethanol-endotoxin interaction with carbohydrate metabolism”. Her postdoctoral experience at Vanderbilt University was supported by a NIGMS Minority Supplement Grant under the mentorship of Dr. Naji N. Abumrad. She progressed through the academic ranks initially as an Assistant Professor of Surgery and Physiology at the State University of New York, Stony Brook and subsequently as Director of Surgical Research at North Shore University Hospital. During that period, she held a Guest Scientist appointment at Brookhaven National Laboratory prior to joining the Department of Physiology at LSUHSC as an Associate Professor. Since becoming a faculty member at LSUHSC, Dr. Molina has obtained tenure and promotion to the rank of Professor and more recently to the Richard Ashman, PhD Professor in Physiology. Dr. Molina’s research has been funded continuously since completing her PhD degree. She has mentored several undergraduate, graduate and post-doctoral trainees. Dr. Molina is a member of the faculty of the School of Graduate Studies, the Graduate Education Committee in Physiology, The Graduate Advisory Council, and is a mentor for the LSUHSC Interdisciplinary Graduate Program. Dr. Molina is an active member of several committees within the LSUHSC and is also actively involved in the Scientific Community outside the institution. Currently, she is the Vice-Chair for the National Hispanic Science Network on Drug Abuse, and Chair of the American Physiological Society Porter Development Committee. In addition, she serves a Councilor at Large for the Hispanic American Medical Association of Louisiana. Research in her laboratory focuses on the impact of alcohol and drug abuse on the cardiovascular, metabolic and immune consequences of acute traumatic injury and hemorrhagic shock. In addition, work in her laboratory also investigates the interaction of alcohol and drug abuse on the behavioral, metabolic, and immune consequences of HIV/AIDS. Currently, work in her laboratory is funded by NIAAA, NIDA, DOD, and the Board of Regents of Louisiana. Dr. Molina teaches the Endocrine Block in Medical Physiology (Spring semester) and in the Biological Systems Graduate Course (Spring semester). Dr. O'Leary is responsible for the development of the clinical faculty and practice sites for the fledgling FIU College of Medicine. Dr. O'Leary has written more than 200 peer-reviewed scientific publications and is the author of four editions of the Physiologic Basis of Surgery Textbook . He is an authority in the field of surgical gastroenterology. He comes to FIU from Louisiana State University Health Sciences Center, where he had been the Isidore Cohn Jr., M.D., Professor and Chairman of the Department of Surgery at LSU Medical Center since 1989. He is a former associate dean of Clinical Affairs and former interim dean of LSU Health Sciences Center. He remains Emeritus Professor and Emeritus Chairman of the Department of Surgery. From 1984-1989 he was Seeger Professor of Surgery at Baylor University Medical Center, in Dallas, Texas. A graduate of the University of Florida College of Medicine, Dr. O'Leary completed his residency in General Surgery at Shands Teaching Hospital at UF. He has earned nearly a dozen teaching awards from the students and faculty of the University of Florida, Vanderbilt University and LSU School of Medicine. He is active in a number of regional and national professional organizations. He has held several leadership positions with the National Board of Medical Examiners, has served as the president of the Southeastern Surgical Congress, the Association of Program Directors of Surgery and as the first vice president of the Southern Surgical Association. Most recently he has been Chairman of the Board of Governors and the first vice president of the American College of Surgeons. BACKGROUND: Dr. Sardi is a surgical oncologist with a special interest in the treatment of intra-abdominal malignancies. Dr. Sardi earned his M.D. in his native South America at the Universidad del Valle in Colombia. After graduation, he completed a one-year internship in Colombia and then moved on to a second internship at South Baltimore General Hospital. Thereafter, he enrolled in and completed residency programs at South Baltimore General and St. Agnes HealthCare. Dr. Sardi completed his training as a fellow in oncologic surgery at The Ohio State University. Dr. Sardi practiced as a surgical oncologist at the Ochsner Clinic in New Orleans, and was the founding Chief of Surgical Oncology at Health Care International in Glasgow. In 1994, he was named Chief of Surgical Oncology at St. Agnes Hospital in Baltimore and was later appointed Medical Director of the Clinical Research Center. Dr. Sardi joined Mercy Medical Center in Baltimore City in February 2006. MISCELLANEOUS: Dr. Sardi one of the select few surgical oncologists in the world who employs leading edge procedures such as IPHC (Intraperitoneal Hyperthermic Chemotherapy) to treat advanced stages of abdominal cancers. IPHC is an aggressive surgical treatment reserved for patients with peritoneal surface malignancies. The procedure, which can take up to 15 hours to perform, combines the extensive removal of cancerous tumors with a highly concentrated dose of heated chemotherapy applied directly to the peritoneal cavity. Alfonso Vargas del Valle nació en Bogotá, DC, y se graduó de la Facultad de Medicina de la Universidad Nacional de Colombia, donde su padre el Profesor Alfonso Vargas Rubiano fue Decano y es Profesor Honorario de Pediatría. Cursó estudios de post-grado en Pediatría dirigido por el Profesor Lewis A. Barness; y de Endocrinología Pediátrica y Diabetes con los Profesores Allen W. Root, Edward O. Reiter y John I. Malone, en la Universidad de South Florida en Tampa y St. Petersburg. Fue Profesor Asistente allí mismo. En 1985 asumió la Jefatura de la Unidad de Endocrinología Pediátrica del Hospital de La Misericordia y la Universidad Nacional de Colombia en Bogotá. En 1987 fue socio fundador de la Sociedad Latinoamericana de Endocrinología Pediátrica-SLEP. Desde 1988 es facultativo del Departamento de Pediatría de la Escuela de Medicina de Louisiana State University en Nueva Orleans, donde actualmente ocupa los cargos de Profesor y Sub-Director del Departamento, a cargo de las Divisiones de Educación y Asuntos Internacionales. Ha recibido varios premios y distinciones por sus contribuciones en educación entre ellos el de “Humanismo en Medicina” y la “Silla Profesoral para Colaboración Internacional en Pediatría”. Como Director del Comité de “International Scholars” de la Lawson Wilkins Pediatric Endocrine Society ha contribuido a que más de cuarenta endocrinólogos pediatras jóvenes clínicos e investigadores de Latinoamérica y de otros países hayan participado en programas de extensión científica y cooperativa con centros académicos en los Estados Unidos de América y en Canadá. Desde el 2002 es miembro y actualmente Sub-Director del “Comité en Niños y Adolescentes” del National Diabetes Education Program-NDEP (www.ndep.nih.gov), un esfuerzo conjunto del “National Institute of Health-NIH” y del “Center for Disease Control-CDC”. Pertenece a varios Comités Editoriales. Ha sido “Profesor Invitado” en diez países de Latino-América, en España, en Italia, en Suiza y en Australia. Ha escrito y publicado más de cincuenta trabajos en revistas y libros especializados. Fue Presidente de la Sociedad Médica Hispanoamericana de Louisiana - HAMAL 2007-09 y miembro del Consejo Nacional de la “National Hispanic Medical Association-NHMA” de los Estados Unidos 2007-2010 . Bio: Internship, Hospital "San Pedro Claver-ISS,"